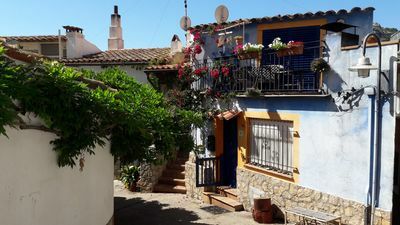 The corner house in the 2004 created "Cortijo de Calahonda" was renovated in the spring of 2018 and furnished to a high standard. Despite the quiet location in a cul-de-sac, you can walk to the shopping center "Los Olivos" with a large supermarket, pharmacy, newsstand, hairdresser and a very good café-restaurant in 3 minutes, the "Centro Comercial El Zoco" with numerous restaurants (Spanish / Chinese / International / Belgian / English), bars, nightclub and other shops can be reached in 3 minutes and the beach in another 4, so from the house in 10 minutes. It takes 10 minutes by car to Marbella, but also by bus (8 minute walk). If you are in good traffic, Málaga Airport, 35 km away, can be reached in less than 25 minutes by car (taxi about 60 €). Of the more than 70 golf courses on the Costa de Sol, also called "Costa del Golf" due to Europe's highest golf course density, over a dozen are within a quarter of an hour's drive, three of them within 5 minutes. 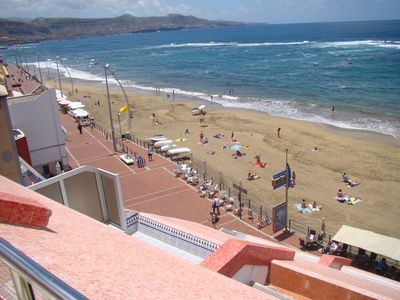 In addition to the beaches of Calahonda reachable within walking distance are also other beaches such. 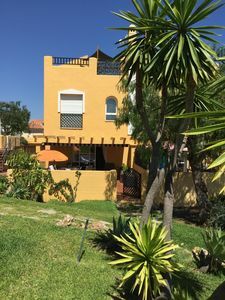 The dunes of Cabopino with textile-free section or the naturist beach of Mijas just a few minutes drive away, as well as the picturesque marina of Cabopino. Everywhere, typical beach restaurants provide for the physical well-being. 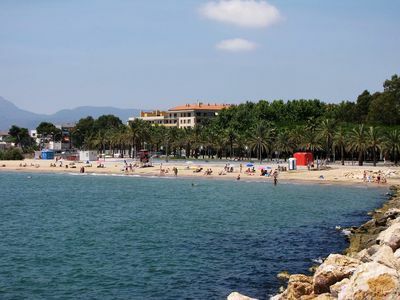 Between Calahonda and Marbella you will find several exclusive beach clubs such. B. "Nikki Beachclub" or "La Cabana". 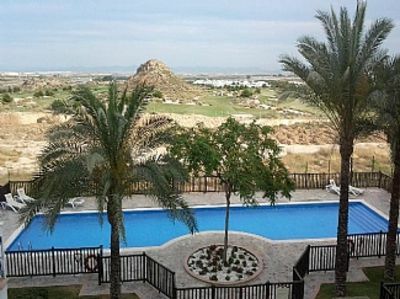 The water park "Aquamijas" in Fuengirola is also just 10 minutes away by car. 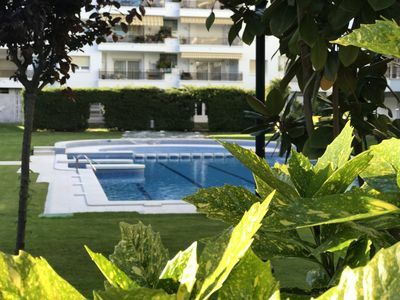 If you want to shop to your heart's content, should definitely "La Cañada", just 10 minutes away by car above Marbella's largest shopping center on the Costa del Sol, visit. 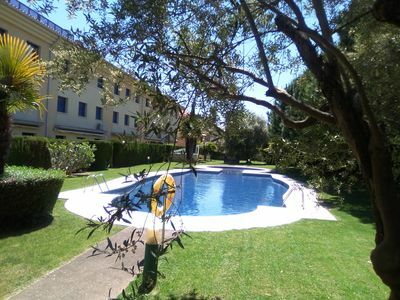 The condominium "Cortijo de Calahonda" has a well-kept garden with a large saltwater swimming pool and a separate children's pool. The plant consists of two rows of houses, each with 10 units. For each row there is a separate entrance with locked gate (intercom with video surveillance). The house is also directly accessible through the closed double garage (automatic to open) in the underground car park. Here you get into the basement of the house, where there is an additional room with a shower room. 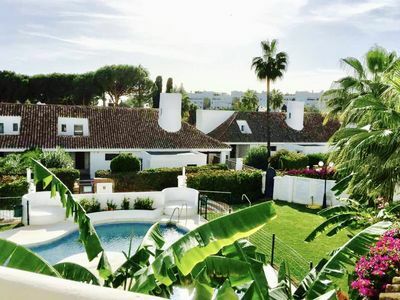 On the ground floor is the spacious living-dining area with open fireplace and access to the over 30m ² garden terrace, from which it is only about 30 meters to the pool. 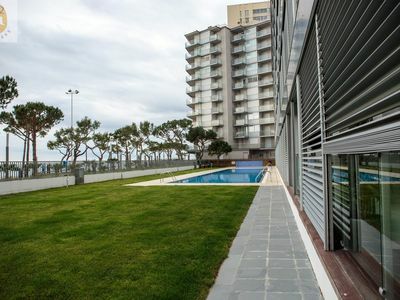 In addition to the fully equipped kitchen with a small balcony complete the hallway and a guest bathroom on this floor. Upstairs there are three bedrooms and two bathrooms, one of them en-suite. 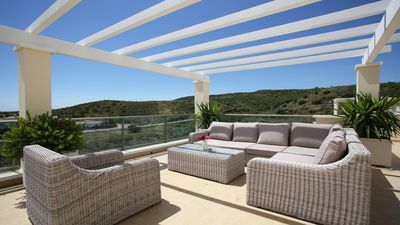 From here, a staircase leads to the roof terrace, from which opens up a magnificent view over Calahonda away on the only about 500 m as the crow flies Mediterranean. 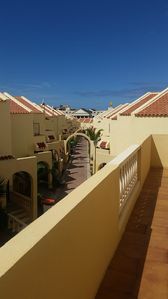 The roof terrace has a shower to cool off between and after the sun, which you can enjoy in a completely private atmosphere. The living areas have all marble floors and a central, for each area separately controllable air conditioning (hot / cold). All bedrooms have generous fitted wardrobes. 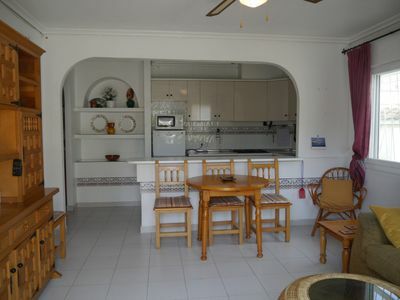 The kitchen is fully equipped with ceramic hob, oven, microwave, coffee maker, toaster, dishwasher and washing machine. Ironing board and iron are also in the house, as well as hair dryers in the bathrooms. 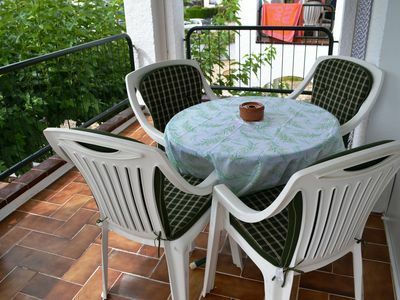 In addition to the solid wood dining table in the house, there is a large garden table with eight chairs and a gas grill on the terrace and four sun loungers with cushions. Another four sun loungers are on the roof terrace. 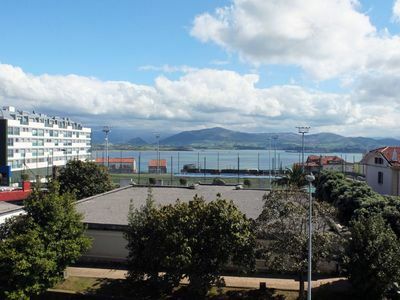 Satellite TV with hundreds of international channels in the living area and WIFI throughout the house. 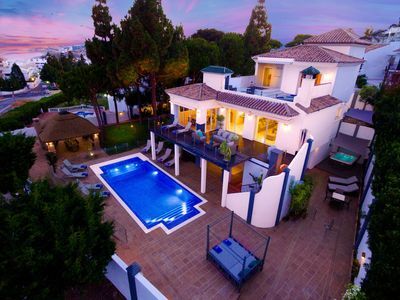 Luxury 7.5 bed/bath spa villa outstanding sea views, 5 minutes walk everything. Fisherman's house in the port of Fornells (Aiguablava).